Serving a population of 400,000 across South West Essex, Basildon and Thurrock University Hospital (BTUH) is responsible for managing about 500,000 medical charts (44 million pages). These paper patient records were held in an offsite records center, which meant staff spent a great deal of time locating and retrieving them. Only one clinician at a time could view patient charts, and occasionally they were not available for appointments or procedures, forcing appointments to be postponed. Here is how we have successfully eliminated these problems by integrating Laserfiche with our hospital Patient Administration System (PAS) using a purpose-built Electronic Medical Records system utilizing Adobe LiveCycle workflow functionality. Since it would be very difficult to get 1,500 clinical users without a technical background trained in using the Laserfiche Client, we created a custom user interface that closely replicated the paper charts that our clinicians were familiar with. The users do not even know that they are using Laserfiche, yet they interact with it constantly through this custom portal. Once a clinician signs into the portal using Windows Authentication, he is presented with information about his next scheduled clinic. All of the patients he will see that day are listed along with their appointment times and supplementary information such as birthdate, age and gender. All of this information is pulled from the hospital PAS and is cross-referenced with Laserfiche to make relevant documents available. The green icon in the above screenshot signals to the clinician that Mrs. Tina Training is a complex patient, one with a large number of associated documents. The yellow icon notifies the clinician that there is an alert, a particular condition or issue of which the clinician needs to be aware, associated with Mrs. Training. To review Mrs. Training’s medical record before her appointment, the clinician selects the patient’s name and clicks on “Open Record.” This brings up all 576 different documents associated with Mrs. Training.a. Each rectangular white icon represents a different document. b. Clicking on one of the document icons pulls the document from Laserfiche and opens it in the custom portal. c. If the clinician needs to annotate the document by, for example, highlighting some text, he can do so here. His annotations will be reflected on the original document stored in Laserfiche. d. To ensure buy-in from the clinical community, it was essential that the clinician could find specific document types within that patient’s record quickly. The panel on the left side of this screen categorizes documents to simplify retrieval. With a couple of clicks, the user can display only prescriptions or filter correspondence that is applicable to their specialty. For example, you can tell by looking at the “Prescriptions” tab that it contains 53 different documents related to prescriptions. A clinician may prefer to view the patient’s medical record on a timeline by clicking a button in the upper right corner of the screen. The clinician can see the entire patient history at once or adjust the timeframe to any specific period such as the last few months or weeks. The different colored bars represent the patient’s various doctor or hospital visits. A green bar signifies a regular visit, an orange bar signifies a hospital stay or a medical procedure and a red bar signifies an emergency visit. Each rectangular white icon signifies one or more documents associated with that particular time period and corresponding document category. Clicking on a document icon finds the document in Laserfiche and opens it in the custom user interface. 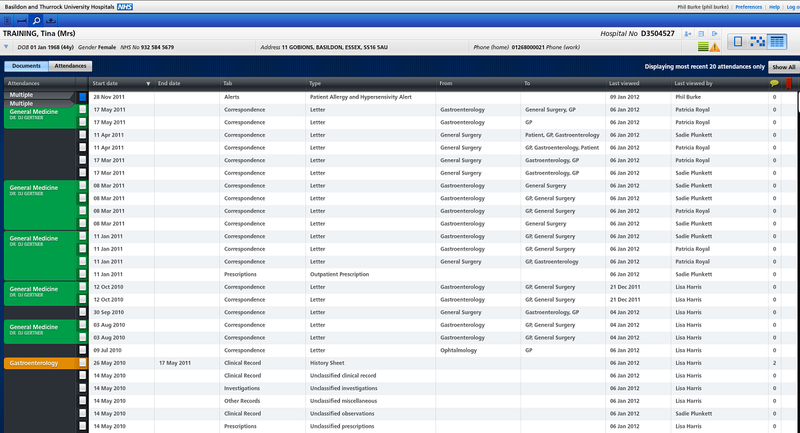 Another way to view a patient record is in the “List” view, which is also accessed by clicking a button in the upper right corner of the screen. 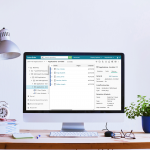 This view lists all of the documents in reverse date order and overlays the patient experience (the patient’s office visits and hospital stays) on the side so that the clinician can see the documents within their context. 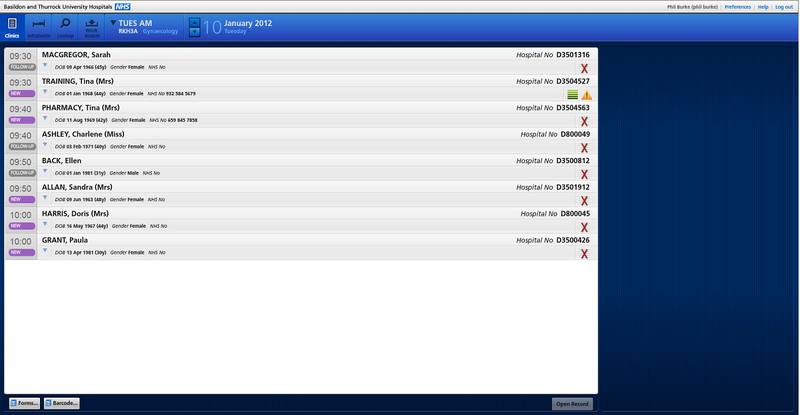 The “List” view also notifies the clinician who last viewed each document. This lets the clinician see if their patient has also visited other doctors in the same time frame. 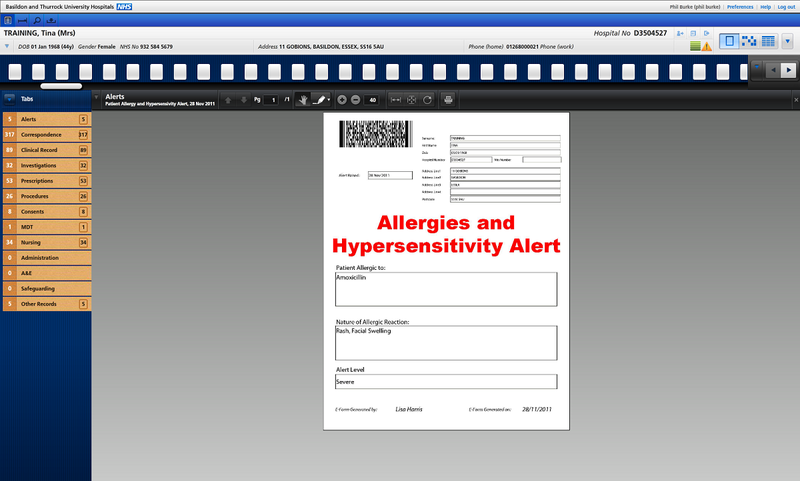 In addition to viewing the patient’s record through this custom interface, a clinician can also trigger an alert, such as a safeguarding alert, for other clinicians. A safeguarding alert is triggered when the clinician thinks that the patient is not capable of looking out for himself and may be at risk of being abused by another person. Since such an alert may contain confidential information, it may sometimes consist of simply asking other doctors to contact the reporting clinician to find out the specific issue. Security is set up in such a way that allows for sensitive documents to be available only to specific individuals and either concealed to other clinicians or behind ‘break glass’ functionality (accessible solely for emergency purposes). Apart from triggering alerts, a clinician can select from a variety of clinical forms contained within an electronic form library. This allows the clinician to perform a range of tasks such as updating a patient’s history or referring a patient to a colleague. The resulting document is stored in Laserfiche as part of the patient’s permanent record. Laserfiche makes it easy to comply with the UK’s BS10008 accreditation for legal admissibility. We duplex scan all of our documents— including the blank pages—and store them in a “Legal” repository where they can be easily accessed in case of litigation. We then remove the blank pages and store these document versions in the regular Laserfiche repository, where clinicians can view them using our custom interface as specified above. This prevents clinicians from wasting time by flipping through blank pages. Make patients’ medical history immediately available to clinicians. Allow clinicians to form connections between episodes of care and dated documentation. Consolidate silos of information from various departments, such as Accident and Emergency, Cardiology and Medical Photography, for a more complete picture of care. Allow concurrent access to a single medical record by multiple clinicians at the point of care. Reduce cancelled and rescheduled appointments due to lost patient files.